An artist’s illustration of a SpaceX Crew Dragon spacecraft docking with the International Space Station (ISS). Crew Dragon’s first demonstration mission, an uncrewed flight to the ISS, is scheduled for Jan. 7, 2019. We now know when SpaceX's new astronaut taxi will head to orbit for the first time. The maiden flight of the Crew Dragon capsule — an uncrewed test mission to the International Space Station (ISS) called Demo-1 — is scheduled to launch Jan. 7, NASA officials announced today (Nov. 21). 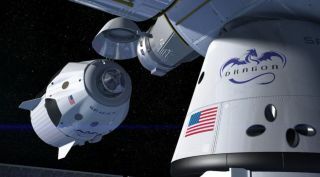 SpaceX is developing Crew Dragon to ferry astronauts to and from the ISS, under a multibillion-dollar contract with NASA. The first crewed test flight of the capsule, known as Demo-2, is currently targeted for June 2019; an in-flight "abort test" that proves out Crew Dragon's emergency-escape systems will take place between the two demonstration missions, NASA officials said in today's update. The robotic cargo version of Dragon has been flying uncrewed resupply missions to the ISS since 2010, under a separate SpaceX contract with NASA. Aerospace giant Boeing also holds a NASA commercial-crew contract, which it seeks to fulfill using the CST-100 Starliner capsule. Starliner's uncrewed and crewed test flights are scheduled to take place in March 2019 and August 2019, respectively, with an in-flight abort test sandwiched between the two. Starliner will fly atop United Launch Alliance Atlas V rockets for the foreseeable future. NASA is counting on SpaceX and Boeing to end the United States' dependence on Russian Soyuz rockets and spacecraft to get astronauts to and from the orbiting lab. This has been the situation since July 2011, when NASA grounded its space shuttle fleet after 30 years of operation. The most recent Soyuz crew launch toward the ISS, on Oct. 11, had to be aborted after the rocket experienced problems about 2 minutes into flight. The two crewmembers, NASA astronaut Nick Hague and cosmonaut Alexey Ovchinin, made a safe emergency landing in their Soyuz spacecraft. An investigation traced the cause of the launch failure to a deformed sensor, which led to an abnormal separation of one of the Soyuz's four strap-on boosters. The next crewed Soyuz ISS launch is scheduled for Dec. 3.